If you're like most people involved with a small business, accounting is the last thing you want to spend a lot of time on. Luckily, QuickBooks 2016 For Dummies makes it easy to keep your finances under control so you can concentrate on other aspects of your business. In no time, you'll find out how to populate QuickBooks lists, create invoices and credit memos, record a sales receipt, track sales and inventory, pay bills, process payroll, track business checkbooks and credit cards, and so much more. QuickBooks is the leading small business accounting software package designed to help users handle their financial and business management tasks more effectively. With plain-English explanations that cut through financial jargon, this easy-to-follow guide walks you through installing the software and configuring QuickBooks for your business needs and goes on to show you how to build the perfect budget, simplify tax return preparation, and generate financial reports—without ever breaking a sweat! 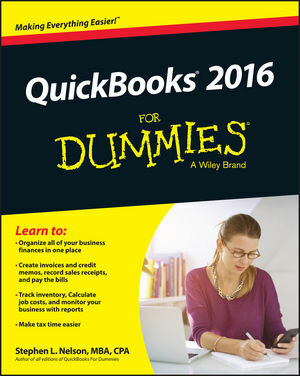 Written by an expert CPA who knows QuickBooks and understands your unique business needs, QuickBooks 2016 For Dummies is your go-to guide for getting past the paperwork and putting the program to work. Stephen L. Nelson provides accounting, business advisory, tax planning, and tax preparation services to small businesses. He is the author of more than 100 books, including all editions of QuickBooks For Dummies and Quicken For Dummies, which have sold more than 4 million copies.